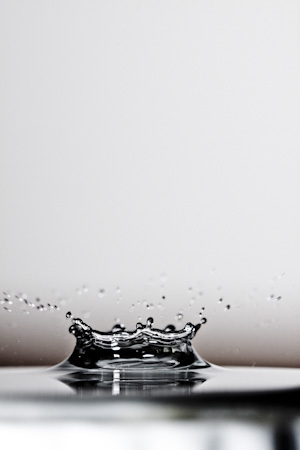 High Speed Photography, also Stop Motion Photography. It is known by some different names but retains a distinct look. This one shot here amazes me when I think about it. To read a little about the set up involved, some of the math and a couple others like it - read on! This was made with a Canon 580exII at 1/64 power. Online, the flash duration for this particular unit is listed as 1/30,000" with a variance of +/- 25%. When you have zero ambient light exposing your frame, the flash duration becomes the effective shutter speed. Flashes don't actually have brighter flashes. They actually just light up for longer. So a 1/64 power will be far faster than a flash firing at 1/1 power. Effectively the shutter speed for above photo is 1/30,000". So that means the real flash duration can be as long as 1/22,000" and as fast as 1/38,000" with the variance calculated.. Either way you cut it - very fast. 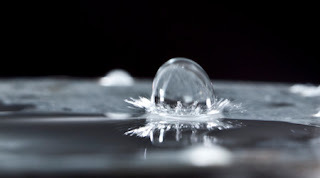 Now lets say your average water droplet lasts 3/4 second from the last moment before it makes contact, to the point when the water is at rest again. At that is rushing the whole process. That means at the longest possible flash duration of 1/22,000", continuous recording of the entire process will use 15,000+ frames. If you were to play that at regular speed of 30fps you would watch the 3/4" drop last 9 minutes, at the very least! This moment here would likely be within the first 20 seconds of that 9 minute video. Also worth noting; to see motion blur on an object when it is effectively frozen at 1/30,000" means it is traveling incredibly fast. Unfortunately I have no reference point in these photos where I can measure the magnification. With a measurement of distances inside the photo you could calculate the speed the splash is moving. Something to remember for my next shoot. So thats all for the weird math stuff I thought about, keep reading for how to set this shot up at home with at least one flash able to move off the camera a tripod, macro capabilities and some other inventive little tools. So what is going to make or break your macro shots? Definitely focus. You need to nail the focus in order to have a decent macro photo. Easier said than done, especially with extremely small, fast moving objects. I have been thinking about it for a few days. A reliable 'drop making machine' if you will. And drop making machine I made! Here is how you can make yours! Tripod. Two of them! Better make it happen somehow, or just finish reading the instructions. Using your own best judgement I am sure you can find a suitable substitute for a second tripod. Water bottle. Flat bottomed. 500mL size works best. Poke a hole in the bottom of said waterbottle. I used a heated wine bottle corkscrew. Center of the bottle is best. Now - butchers twine, string, rope. Anything small enough to fit through the hole. Pull a length of it through to the spout of the bottle. Tie a knot bigger than the hole you just poked. Pull it back through so it stops at the knot. Trim your string so it hands anywhere between 2 to 4 inches below your bottle. Essentially this is your inverted wick. Fill your bottle up with water, and replace the cap! Important step believe it or not. I had my water filled bottle sittin on my second, older, more broken tripod with its center section taken out so it was a clear drop to the supporting surfact. This is where my wick went down and as long as it remains still - will continue to put pretty little drops in a consistent location for your photographing pleasure!! How to do high speed water photography? Well this certainly wasn't my first attempt at skinning this cat. It will take practice to develop your macro photography skills. Basically, tripod is necessary - incredibly steady one. A macro capability on your lens, however you deccide to achieve this. And finally a dark ambient setting using synchronized flashes at extremely fast durations. Would you believe that a flash can actually still leave things blurry? Well if its going to happen - its when your shooting macro. I will try to get a post up on macro photography soon for those that need more pointers, along with some set-up shots, etc.